In keeping with last week’s post, here’s the GPS log from yesterday’s photowalk with our Meetup.Com group Dallas Photo Walk. 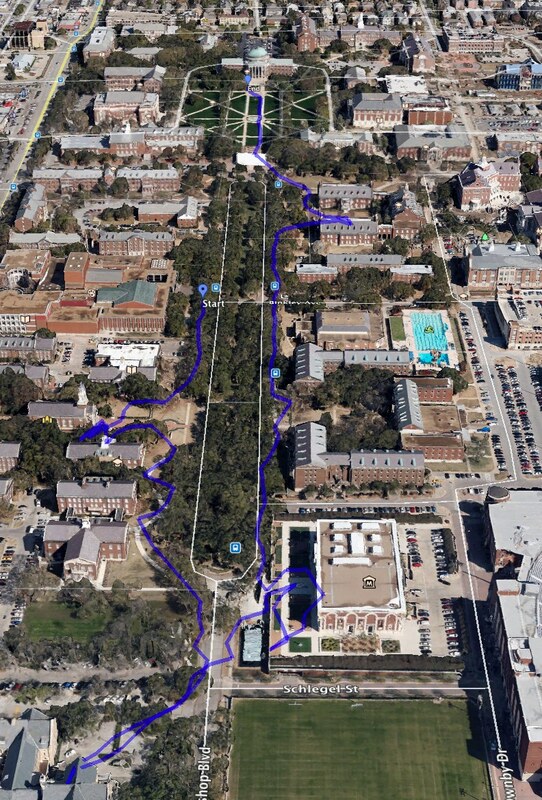 We had a fairly-short walk on the SMU campus in Dallas. Unfortunately, SMU’s campus is the most architecturally-homogenous university campus I’ve ever been on. Every single building looks the same. And not in a photogenic, interesting way! That, combined with cold, overcast weather, meant that I didn’t come away with too many photos that I’d call “great”, but I will, of course, post some on the photoblog as I get to them (today’s photo is from this walk!). I still plan on doing a post on how I use GPS logging software to tag locations to my photos, but I’ve been sick and lazy and haven’t gotten around to it! My wife and I recently took another cruise, so I took advantage of our “sea days” to shoot a quick little ambient scenes video using my 60D. Enjoy! Also, since I primarily shoot stills, I’m used to usually shooting in shutter-priority or aperture-priority and, since I’d already determined that I wanted a specific shutter speed (0.8 second), I made the mistake of shooting in shutter-priority. I should’ve shot in full manual, as this would’ve kept my aperture constant as well, preventing the variations in black levels that are evident in the final video. (The varying brightness of the cars’ lights made the camera constantly adjust aperture–this probably could’ve been fixed in post, but I was just experimenting). After getting back to my Mac, I downloaded the files to Lightroom and edited the first photo for noise reduction, sharpness, tone curve, exposure and color balance. I also cropped it to 16:9. I then synced this first image’s edit to the rest of the images in the sequence. I exported out to a folder at 1920×1080, then loaded up FCPX.